Another environment which is detrimental to the Dow Theory is weak cyclical bull markets. What is a cyclical bull and bear market? I see cyclical bull/bear markets as a long movement which is an order of magnitude less than the secular bull/bear market. The longest movement is the secular bull/bear market. Beneath it we find cyclical bull/bear markets. And beneath them, we have our Dow Theory appraised primary bull/bear markets. Thus, cyclical bull/bear markets are in both time and extent between secular bull/bear markets and primary bull/bear markets as determined by the Dow Theory. In my post concerning the “stress-test” under secular bear markets, it was shown that, in spite of secular, headwind, the Dow Theory (especially Schannep’s) was able to remain positive and outperform buy and hold. However, secular headwind took a toll on performance. While positive, it was less than that attained when there was a secular bull market environment. To begin with, how do we define “cyclical markets”? While there are lots of diverging opinions when it comes to defining them, I’ll stick to Schannep’s definition, which I honestly feel is very accurate and even actionable (albeit with a lesser performance than the Dow Theory itself). According to Schannep a cyclical bull market is one which advances 19% on both the Dow Jones Industrial Average and the Standard & Poor's 500 over any timeframe. A cyclical bear market is one which declines 16% on both the Dow Jones and the S&P 500 over any time-frame. 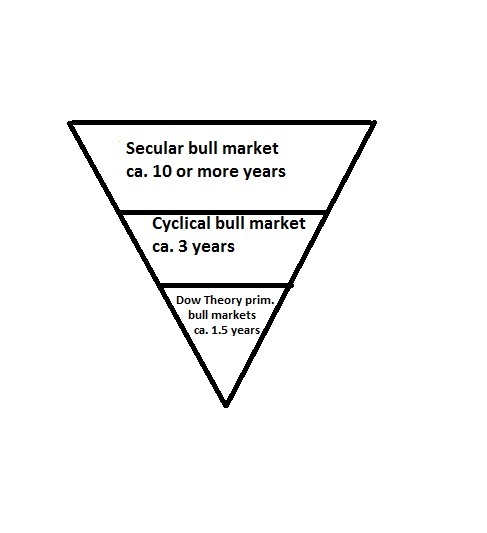 Please go to Schannep’s website “thedowtheory.com” in order to further deepen the concept of cyclical bul/bear markets and its predictive power. Those really intent on mastering the concept of cyclical bull and bear markets are advised to read chapters 5 to 7 of Schannep’s book “The Dow Theory for the 21st Century”. Please find below a graph depicting the relationship between secular, cyclical, and Dow Theory determined primary bull and bear markets. This post focuses on “weak” cyclical bull markets. What do I mean by "weak". The average cyclical bull market has an extent of 111.1% (median 74.1%). The average duration of cyclical bull markets is 32.9 months (median 25.4 months). Thus, “normal” cyclical bull markets are supposed to be tailwind for the Dow Theory (which operates on a lower time frame, as the average trade lasts only 1.31 years –ca. 15.7 months-, and the average extent of a swing amounts to ca. 46.5%). Please mind that the primary bull markets as determined by the Dow Theory last almost exactly ½ of its cyclical peers. The same applies to time: 15.7 months is almost ½ of 32.9 months. More food for thought: the total number of trades of the Dow Theory roughly doubles the number of cyclical bull markets. However, there have been several instances of “fibrillation” afflicting cyclical bull markets in which the extent (average ca. 40%) and time (average ca. 3 months) of the cyclical bull market was much lower. Such lapse of “abortive” cyclical bull markets was the norm from a period spanning from 1929 to 1942. Hence, under the then prevailing tough market environment (secular bear market), cyclical bull markets had to face headwind which resulted in smaller swings. Our question is: How did the Dow Theory fare during such a tough period? As I explained here, to compare the Dow Theory versus buy and hold, the right way to compare performance is to start at a primary bear market low (start for buy and hold), the “buy” price of the next primary bull signal (start for the Dow Theory) and finish with the last primary bear market sell signal (end for the Dow Theory) and the final primary bear market low following such a bear market signal (end for buy and hold). Since Schannep’s Dow Theory (which involves the S&P 500) starts in 1953, we have to follow the official “Rhea/classical” Dow Theory record in order to compare performances in the 1929-1942 period. Furthermore, I use the Industrials in order to assess performance. The first Dow Theory trade started on May 24th, 1933 at a price of 84.29. The last Dow Theory trade was closed on May 13th, 1940 at a price of 137.5. The final primary bear market low following the primary bear market signal, was made on 6/10/1940 at a price of 111.84. Thus, buy and hold, made 171% (111.84/41.22 = 171%) during this period spanning from 1932 to 1940 (period when the Dow Theory signaled trades). The Dow Theory underperformed and only made 101% (see table above). Hence, as it was seen with secular bear markets, weak cyclical bull markets are headwind for the Dow Theory. However, we see that it did not self-destruct. Furthermore, as I stress ad nauseam, the Dow Theory shines when buy and hold falters. During the same period of “abortive” cyclical bull markets, there were of course cyclical bear markets. Thus, during the 1929-1932 crash, there were five cyclical bear markets (interspersed with four cyclical abortive bull markets) with hair-curling declines (the smallest -37.4%, the largest -53.6%). During the 1929-1932 period, when buy and hold lost ca. 80%, the Dow Theory was flat. Thus, when making comparisons, we have to be careful. It is true that from 1933 to 1942, when there were trades due to a hesitant bull market condition, the Dow Theory, while making money, underperformed buy and hold. However, if we include in our period of the market crash, the Dow Theory was unscathed by it, whereas buy and hold was killed. By the way, strong cyclical bear markets might also be good for the Dow Theory, as it entails losses for buy and hold, and, more importantly, in all likelihood, it enables Dow Theorists to re-enter the market at a much lower price. All in all, even under week “cyclical” bull markets, the Dow Theory makes profits.